"Hello world" is the beginning of everything when it comes to computing and programming. It's the first thing you learn in a new programming language, and it's the way you test something out or check to see if something's working because it's usually the simplest way of testing simple functionality. Warriors of programming language wars often cite their own language's "hello world" against that of another, saying theirs is shorter or more concise or more explicit or something. 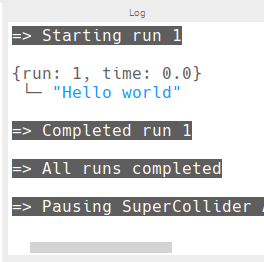 Having a nice simple readable "hello world" program makes for a good intro for beginners learning your language, library, framework, or tool. I thought it would be cool to create a list of as many different "hello world" programs as possible that can be run on the Raspberry Pi using its Raspbian operating system, but without installing any additional software than what comes bundled when you download it from the Raspberry Pi website. I've created a GitHub repository of these programs, and I've explained 10 of them for you here. Scratch is a graphical block-based programming environment designed for kids to learn programming skills without having to type or learn the synax of a programming language. 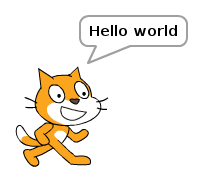 The "hello world" for Scratch is simple—and very visual! 1. Open Scratch 2 from the main menu. 3. Drag a say Hello! block into the workspace on the right. 4. Change the text to Hello world. 5. Click on the block to run the code. Python is a powerful and professional language that's also great for beginners— and it's lots of fun to learn. Because one of Python's main objectives was to be readable and stick to simple English, its "hello world" program is as simple as possible. Open Thonny Python IDE from the main menu. Save the file as hello3.py. Ruby is another powerful language that's friendly for beginners. Sonic Pi, the live coding music synth, is built on top of Ruby, so what users actually type is a form of Ruby. Open Sonic Pi from the main menu. Unfortunately, "hello world" does not do Sonic Pi justice in the slightest, but after you've finished this article you should check out its creator Sam Aaron live coding, and see the tutorials on the Sonic Pi website. Open Text Editor from the main menu. Save the file as hello.rb in the home directory. Open Terminal from the main menu. Open Chromium Web Browser from the main menu. Right-click the empty web page and select Inspect from the context menu. Bash (Bourne Again Shell) is the default Unix shell command language in most Linux distributions, including Raspbian. You can enter Bash commands directly into a terminal window, or script them into a file and execute the file like a programming script. Save the file as hello.sh in the home directory. Note you'd usually see a "hashbang" at the top of the script (#!/bin/bash), but because I'm calling this script directly using the bash command, it's not necessary (and I'm trying to keep all these examples as short as possible). You'd also usually make the file executable with chmod +x, but again, this is not necessary as I'm executing with bash. Save the file as Hello.java in the home directory. Save the file as hello.c in the home directory. Note that in the previous examples, only one command was required to run the code (e.g., python3 hello.py or ruby hello.rb) because these languages are interpreted rather than compiled. (Actually Python is compiled at runtime but that's a minor detail.) C code is compiled into byte code and the byte code is executed. If you're interested in learning C, the Raspberry Pi Foundation publishes a book Learning to code with C written by one of its engineers. You can buy it in print or download for free. C's younger bother, C++ (that's C incremented by one...) is another fundamental low-level language, with more advanced language features included, such as classes. It's popular in a range of uses, including game development, and chunks of your operating system will be written in C++ too. Save the file as hello.cpp in the home directory. Readers familiar with C/C++ will notice I have not included the main function return values in my examples. This is intentional as to remove boilerplate, which is not strictly necessary. Perl gets a lot of stick for being hard to read, but nothing much gets in the way of understanding its "hello world" program. So far, so good! Save the file as hello.pl in the home directory. Again, I learned Perl at university, but unlike Java, I have managed to successfully avoid using it. So that's nine different programming languages covered, but let's finish with a bit more Python. The popular computer game Minecraft is available for Raspberry Pi, and comes bundled with Raspbian. A Python library allows you to communicate with your Minecraft world, so open Minecraft and a Python editor side-by-side for some fun hacking your virtual world with code. Open Minecraft Pi from the main menu. Create and enter a Minecraft world. Press Tab to release your focus from the Minecraft window. Save the file as hellomc.py. 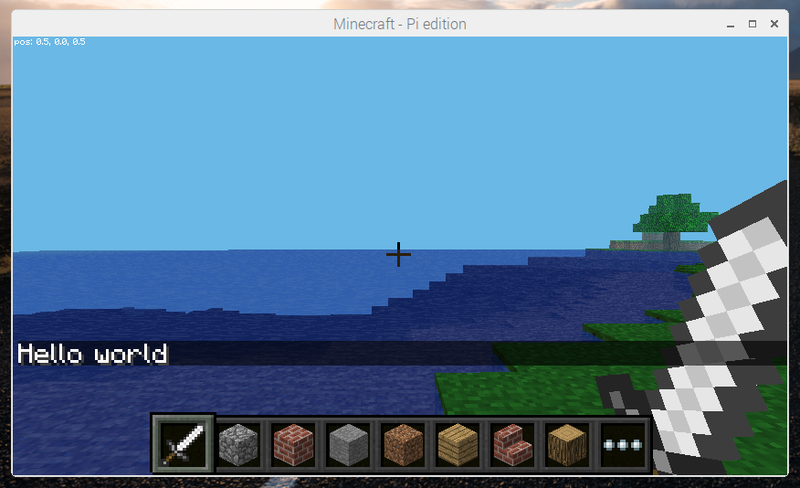 Read more about hacking Minecraft with Python in my article Getting started with Minecraft Pi. 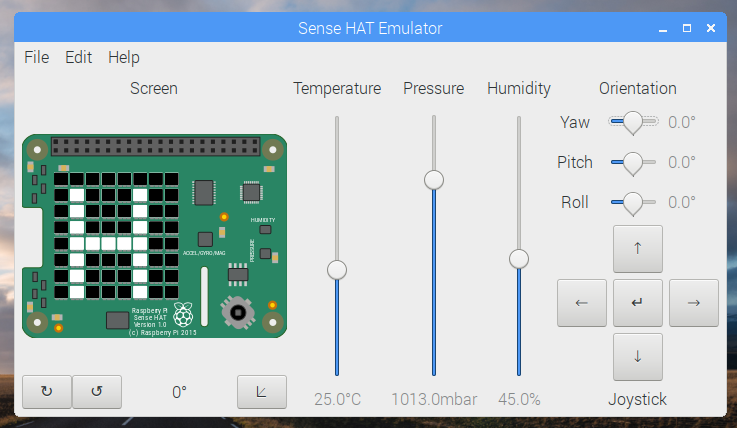 Finally, let's look at the Sense HAT Emulator. This tool provides a graphical representation of the Sense HAT, an add-on board for Raspberry Pi made especially to go to space for reasons explained in this article. The sense_emu Python library is identical to the sense_hat library except that its commands get executed in the emulator rather than on a physical piece of hardware. Because the Sense HAT includes an 8x8 LED display, we can use its show_message function to write "hello world". Save the file as sense.py. That's it! I hope you learned something new, and have fun trying out new "hello world" programs on your Raspberry Pi! You can find more on the GitHub repository —and feel free to suggest more in an issue, or send me a pull request with your contribution. If you have any other interesting "hello world" programs you want to share—related to Raspberry Pi or not—please share them in the comments below. ...instead of embedding the \n in the literal text string. I really enjoyed this. I was wondering how hard it was to access the various languages on the RPi. I actually enjoyed Java greatly but since not having had an IDE like J-Builder to work with I have let it lapse. I did a fair bit of work with TomCat that was just scripts, but again that has lapsed. Currently I am getting by quite comfortably with Python, but it seems a jungle of idiosyncratic libraries while extremely powerful and helpful, tend to offer many parallel paths. Anyway I am grateful for it. I was also pleased to see C & C++ mentioned as well, as I am heavily into Arduino. I will definitely check the book you have referenced. It was a nostalgic stroll down memory lane... thanks!!!! PS No mention of of the black sheep in the family, BASIC, though I did love my BBC32k dropping straight into BBC BASIC, it was Awesome, but we have all moved on! You could try basic256 from the Raspbian repository, though perhaps not "standard package" for the purposes of this article? Hashbang, or more correctly known as a "shebang". Easily remembered due to the unfortunate Ricky Martin earworm.